Make the marinara sauce and set aside. Add the onion, celery and carrot and cook until soft, about 7 - 10 minutes. Crumble the sausage with your hands into the pot and then add the beef. Cook until almost no longer pink. Season with 1/2 teaspoon salt and pepper, each. At this point, if too much grease has rendered, you can drain it off. Add the wine and cook until liquid is almost all gone, about 4 - 5 minutes. Add the marinara and tomato paste and simmer for 1 hour. Taste and adjust seasonings, if necessary. Set aside until ready to assemble dish. Cook the ziti according to package instructions for al dente. Drain and set aside. In a large baking dish, ladle a thin layer of the meat sauce on the bottom of the dish. 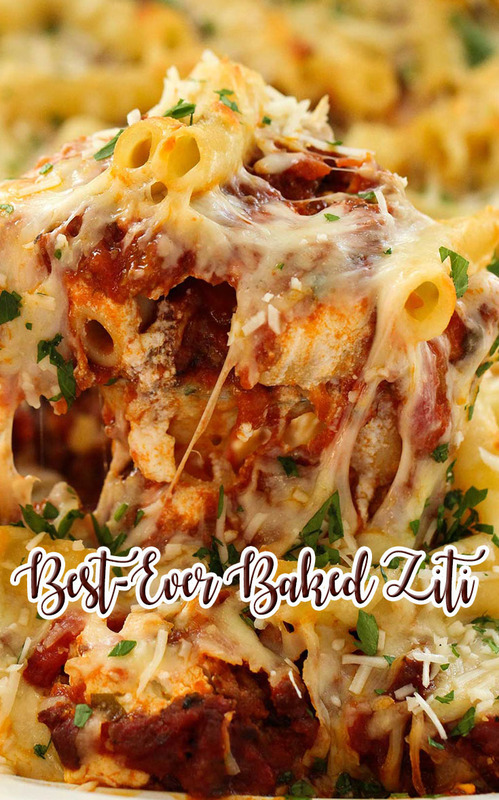 Add a layer of cooked ziti. Top with dollops of ricotta and then about 3/4 cup of mozzarella. Sprinkle about 1/4 cup of Parmesan on top of that. Top with a handful of pasta, then another cup of the sauce, a 1/2 cup of the mozzarella, and another 1/4 of Parmesan on top. Baked, uncovered, for 45 to 50 minutes, until lightly browned on top and bubbly.